I don’t believe my new novel was actually supposed to be available just yet, but I’m hearing that it’s been seen on shelves . . . so hey! If others can jump the gun, so can I! Ta-daaa! Here you have it, The Fourth Wall! You may have seen me refer to this book by its original title, Mister Baby Head. For some reason the publisher thought that title was not commercial. This is the third of the Dagmar Shaw books, in which Dagmar faces her greatest challenge yet, infiltrating the most dangerous, corrupt, abusive, sinister industry on the planet . . . Hollywood. Rather than try to explain a rather complex book, allow me to quote from the lovely review in, of all places, the Winnipeg Free Press. This is an ambitious novel, blending elements of science fiction, thriller and Hollywood epic into one wildly inventive narrative. It’s the kind of genre-bender that you can spend a lot of time trying to describe, or you can simply say: go read it, right now. Yeah. Read it right now! I should point out that in addition to its other virtues, the book features cottage cheese wrestling! You absolutely wanna read about that, right? 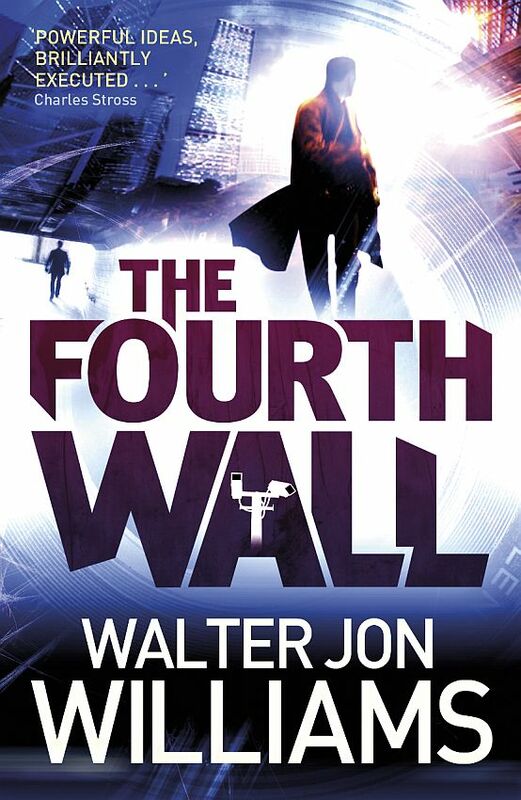 The Fourth Wall is available right now in trade paperback at Amazon and for Kindle. Barnes & Noble and No0k any day now, or so I assume. And also, to get you good and hooked in this series, the first Dagmar book, This Is Not a Game, is available in e-formats for a mere $2.99! Here’s the Nook! Here’s the Kindle! And I think I should mention that Walter Jon Williams books make excellent Valentine’s Day gifts! Nothing says “You are my one and only love muffin” than having the entire trilogy appear on someone’s doorstep in a lovely gift-wrapped package, or appearing as if by magic in his or her chosen e-reader. Go forth and read, o reader! Rapture awaits you! Just checked. It is shipping from Amazon if you want to read it on a dead tree. The E-version is not shipping until the scheduled date. Never mind, I found it: Deep State. I accidentally started this book today and now I can’t put it down. I’ve had this pre-ordered – eagerly awaiting! Is there any way to get the discounted ebook when you’re outside the US and you can’t buy from Amazon.com? Got my dead tree copy. I like the new title. I downloaded it to my Kindle last night. I’ll probably start reading it tomorrow (and then, knowing your stuff, probably won’t do anything else for the next few days!). I saw it while browsing at local B & N y’day and bought it immediately. I’m up to Act 3(no spoilers here:::grin:::). Where did you get the idea for Sean and his bio? It arrived in the mail today and I am cracking it open tonight. The housekeeping will wait. Mike, Sean pretty much came out of my head, like all my characters. He was a character I thought about for years before I found the right vehicle to tell his story. YMMV, if you don’t live in a country with Amazon access, I don’t know what to tell you. Can anyone out there give a reader a hand? In order to shame your publisher for what I’ll just assume was a niggling advance to you, I pre-ordered The Fourth Wall on my Nook. Just finished the first marathon read through. Enjoyed it immensely, and found it refreshing to see Dagmar and her coterie from the viewpoint of an outsider. My copy just arrived in New Zealand today! Yippee! Next post: Madonna . . . HIGH PRIESTESS OF SATAN!! !